After a brief few days recuperation from my overseas travels, it was soon time to get back to my main pastime – cookery classes. No rest for the wicked! Last Saturday and Sunday was spent at The Company Farm in Wauchope, in country New South Wales. It’s one of my favourite places for a cookery class weekend. We chose a new menu to preview over both days. As usual, many hours were spent setting up all the ingredients. 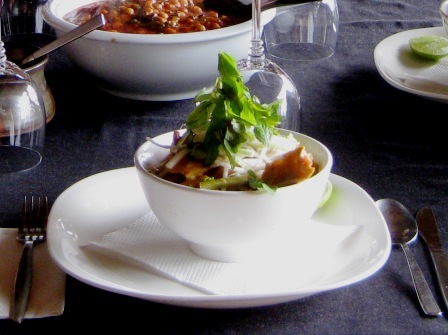 In fact, half of the ingredients were for the star of the weekend, my famous laksa. Twist my arm and I’ll share the recipe with you. The first class started after lunch and finished as the sun set over the rolling hills and illuminated our dinner table. Here’s a close-up of the delectable laksa. Certainly a meal in itself. The second class was a morning event, concluding in a late lunch. Here we all are again, a different intimate group, poised to dive in to our laksa feast. Here’s our dessert. Yogurt was hung in a cloth to reduce down over a couple of days. 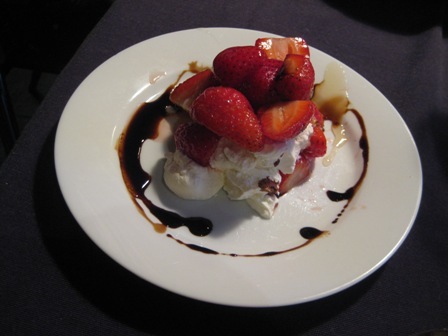 The yogurt cream cheese was served with fresh local strawberries macerated in a little raw sugar, drizzled with forest honey and a swirl of balsamic reduction. Then I was off to the airport for a picturesque flight back, down the north coast of the state, to Sydney, and home to bed as the sun again set on a successful culinary weekend.